A walk through the woods unveils the rare blooms of spring. Luckily for me, since I live in these northern climes, I love ice and snow. As an amateur naturalist and nature photographer, I look forward each winter to tracking wildlife in the snowy woods or delighting in the beauty of sparkling snow and crystalline waters. But none of that can compare with the pleasure of finding the very first flower of spring. And I don’t even have to wait until winter is over to find it. I’m talking about Skunk Cabbage. It’s not a flower that poets sing of, nor does it even look much like what we ordinarily think of as a flower, with its bulbous spathes of Morocco red or chalcedony green protruding from snow-covered muck. But Skunk Cabbage is indeed a flower, with ripening pollen and a (rather disagreeable!) scent that attracts the very earliest pollinators, sometimes even as early as late February. It also creates its own little localized spring, producing enough chemically induced heat to melt the snow around itself, weeks before the sun has reached the vernal equinox and ushered official spring into the rest of the woods. Perhaps the Skunk Cabbage’s charms are of a kind that only a wildflower nut like myself can delight in, but that is indeed a title I proudly lay claim to. I’ve been wandering the woods and waterways of Saratoga County for decades now, documenting the name and place and bloom time of every wildflower I find, and I treasure them all, from the rarest endangered orchid in an isolate bog to the commonest weed that sprouts from a crack in the sidewalk. What I’ve found is that we here in Saratoga County are blessed with a teeming profusion of native wildflowers, as well as a remarkable abundance of protected nature preserves where they can happily grow. The first of these special places I visit each year is Orra Phelps Nature Preserve on Parkhurst Road in Wilton, named for the noted naturalist and physician who once made this forested 18-acre tract her home. Now managed as a nature sanctuary by the land conservation organization, Saratoga P.L.A.N., it’s here that I know I will find prolific masses of Skunk Cabbage shoots spreading across a spring-watered swale. And just a few weeks later, I will return to find the diminutive white Snow Trillium displayed along the path. Orra Phelps herself must have planted these lovely flowers, and for this I am very grateful. Otherwise, I would have to visit Pennsylvania or Ohio to see them, since their native range is far to the south and west of Saratoga County. And they are truly a treasure, this miniature flower with a delicate beauty that belies their toughness. Aptly named as they are, Snow Trilliums will bloom even while the snow still lies in shaded hollows of the woods and nighttime temperatures still plunge well below freezing. As the season progresses, the forest and creekbanks at Orra Phelps will burgeon with violets, trilliums, bellworts, and many more of the well-loved favorite wildflowers that we can find in nearly every springtime woods. But to locate the truly rare native flowers, I head out to Skidmore College and its adjacent North Woods. This remarkable 170-acre wooded tract attracts botanists from regions around, who seek among the limestone boulders littering the forest floor for some of the most uncommon plants we have in the state, plants that depend on the lime-enriched soil of this woods. Some are so rare— Goldenseal or Ginseng, for example—that I have to visit them in secret, so as not to reveal their location to potential poachers. Others are so abundant in this rich habitat, it’s hard to believe that they could be considered rare. I’m thinking of the Green Violet, for example, a knee-high plant that looks nothing like our other, more common violets, with its tiny green nubbins hanging from the leaf axils. Hundreds of this plant cover a wide swath of the Skidmore woods so thickly almost nothing else will grow there. And yet, botanists tell us that this is the only place in all of Saratoga County where Green Violet has been found. Of course, there are many other species of violet here in this rich Skidmore woods: the Common Blue, the Wooly Blue, the Northern White, the Downy Yellow, the Long-spurred, the Dog Violet, and even a deliciously fragrant introduced species, the tiny English Violet, which blooms much earlier than all the rest and invites me to drop to my knees to inhale its exquisite scent. If I had to pick a favorite, though, it might be the Canada Violet. This stemmed violet (bearing leaves and flowers on the same stems) is pristine white on its pretty face, but its flower buds and the backs of its petals are tinged the most delicate purple. With a bright-yellow throat and deep-purple stripes on its lowest petal, the Canada Violet is truly a beautiful flower. Ah, but the woods are so full of beautiful flowers in spring, how could I really name a favorite? I love them all, each for its own reasons. Who could not love the dear Hepaticas, in shades that range from purest white through palest lavenders and pinks to deepest purple or magenta? I start looking for their fur-covered buds when nothing but dead brown leaves are covering the ground, and suddenly, I see that the forest floor is teeming with them. About the same time, we will start to find Bloodroot, its dazzling white blossoms centered with sunny yellow. Or the shy Trout Lily, hiding its freckled face within its bright yellow nodding blooms. And there’s nothing shy at all about the spectacular Columbine, dangling trumpet-shaped flowers of the reddest red imaginable, thriving among the most delicate of all the spring flowers, the Miterworts, with their tiny blooms as intricate as snowflakes. For visual impact, not much could outshine the masses of Large-flowered White Trilliums that carpet the forest floor in mid-May, a veritable sea of large snowy blooms. But come back a week or so later and see that that sea of white has transformed itself into a sea of delicate pink as the flowers age. Spectacular! The rich limey soil of the Skidmore woods is also home to one of New York state’s most spectacular orchids, the beautiful but rather elusive Yellow Lady’s Slipper. When I lead nature walks in this woods each spring, this is the prize that never fails to delight the participants, most of whom express amazement when I tell them that New York is home to nearly 60 species of native orchids, more species, even, than a tropical state like Florida. Not all of these New York native orchids are as showy as the Yellow Lady’s Slipper, though. Nor the equally showy Pink Lady’s Slipper, which blooms even more abundantly in Saratoga County than does its yellow sister. But to find the Pink Lady’s Slipper, we have to visit another site with a more acidic soil. The Pink Lady’s Slipper prefers a piney woods with a sandy soil, and I can think of several places I could go to look for this pretty orchid. Wilton Wildlife Preserve and Park is one, and so are parts of Moreau Lake State Park, but the site where I have seen Pink Lady’s Slippers blooming with unparalleled abundance is Woods Hollow Nature Preserve near Ballston Spa. At the center of this 130-acre preserve lies a small serene pond surrounded by a forest of mixed hardwoods and conifers, including several species of pine. The first time I walked on the broad path leading down to the pond, I could hardly believe my eyes, I saw so many Pink Lady’s Slippers sprung up from the carpet of pine needles. I stopped counting after I reached a hundred in robust bloom. Also abundant among the pines at Woods Hollow is the lovely evergreen plant called Pipsissewa, which will bloom with pink-tinged white waxy flowers later in summer. But even in spring, this plant adds its charm to the forest, with its whorls of dark-green, shiny, finely-toothed leaves. Woods Hollow offers an interesting variety of habitats, from pinewoods to wetlands to sand plain to open meadow, each habitat hosting its own species of flowers throughout the growing season. If you come to witness the spectacular display of Pink Lady’s Slippers in the springtime pine woods, be sure to continue your walk until you reach the open sand plain where masses of Wild Lupine will be spreading their vivid blue blooms. It’s interesting that this remarkably showy pea-family plant—the only food source for the larvae of the endangered Karner Blue Butterfly— is happiest growing in arid places where almost no other plants will grow. To find the widest variety of pretty spring flowers, take the wooded paths that follow the stream or circle the pond. It’s here you will find the bright-fuchsia Fringed Polygalas sharing a bank with the dainty white Starflowers and lacey Foamflowers. If you come the right week, you may even happen upon a few Painted Trilliums, their three white petals splashed with deep rose-pink. All will be blooming at once, as springtime ephemerals do, to complete their flowering and seed production before the overhanging trees leaf out and steal all the sun for themselves. How lucky we are, here in Saratoga County, to have so many native wildflowers that thrive in such abundance, and in every season, as well. But nothing can compare with the pleasure of finding that first flower of spring — even if it doesn’t look much like a flower! Moreau Lake State Park has nearly 5,000 acres of forest, mountains, and waterways, where Trailing Arbutus shelters among rocky banks in April, and clove-scented Early Azalea perfumes the air in late May. At Shenantaha Creek Park in Malta, Dutchman’s Breeches flourish as thickly as Dandelions. 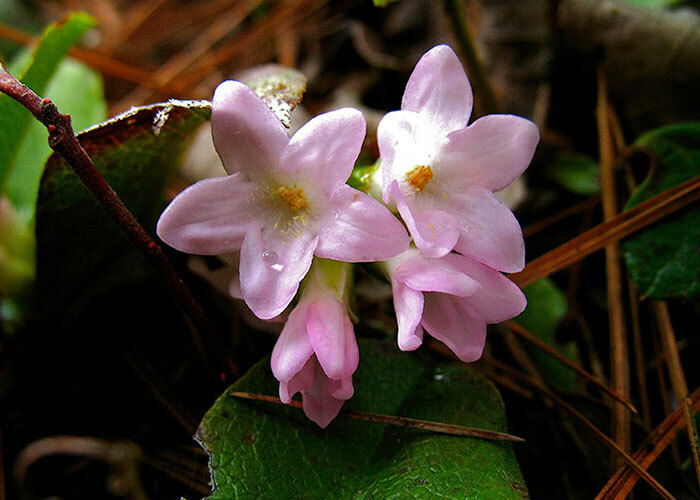 At the Ballston Creek Preserve, the forest floor is carpeted with thousands of pink-striped Carolina Spring Beauties. Bog Meadow Nature Trail just east of Saratoga Springs is where the ever-more-rare Nodding Trillium still finds a happy home. The 10 public nature preserves around the county owned and managed by Saratoga P.L.A.N. all offer a wildflower abundance distinctive to each site. Visit saratogaplan.org. The Wilton Wildlife Preserve and Park is home to a diversity of ecological communities, including sandplane sites where wild Lupine thrives. There are other tracts uncounted, perhaps in your own back yard.